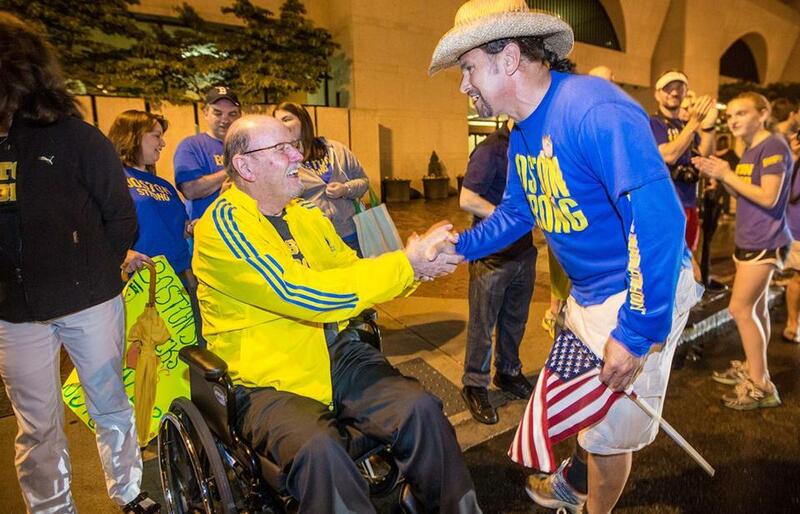 Carlos Arredondo shook hands with bombing victim John Odom at the One Run for Boston event on June 30, 2013. WASHINGTON — A cowboy hat and a blood-soaked American flag, both belonging to Boston Marathon bombing rescuer Carlos Arredondo, are among relics of the April 2013 attacks that have found their way into an exhibit in a Washington, D.C., museum. The Crime Museum, a for-profit institution in a neighborhood full of tourist attractions, opened an installation Wednesday dedicated to domestic terrorism and hate crimes. In addition to a section on the Marathon bombing, it features displays on the Sept. 11, 2001, attack on the World Trade Center and the 1995 Oklahoma City bombing. Arredondo said he loaned the museum his cowboy hat — which was featured in iconic photographs of him helping to rescue Jeff Bauman — to help the public process the extreme violence at the Marathon finish line. While the museum had been assembling the broader exhibit for almost two years, it collected the Boston items in the last two months after difficulty finding a source for items to display. That is when Crime Museum chief operating officer Janine Vaccarello contacted Casey Sherman and Dave Wedge, authors of “Boston Strong,” a book about the bombing. Sherman and Wedge asked survivors and their families for items, and the museum completed its exhibit with Arredondo’s hat the night before it opened. The exhibit opened at a pivotal time in the attack’s history — less than a month before the two-year anniversary and in the midst of suspect Dzhokhar Tsarnaev’s trial — and while much of its legacy is undetermined. The Federal Bureau of Investigation advised the Crime Museum on the exhibit, but could not contribute items from Boston because of the ongoing investigation, according to Crime Museum executives. “It’s a somber exhibit, but it pays tribute to the survivors, and I think we find the same thing with the trial every day,” said Wedge, who covered the Tsarnaev manhunt for the Boston Herald. As the trial unfolds, the Crime Museum made a small but conspicuous decision: The exhibit features a copy of the controversial August 2013 issue of “Rolling Stone” with a cover story on Tsarnaev, but with a description placard placed to obscure his face. Vaccarello said this was part of the museum’s commitment to avoid glorifying suspects and convicts. The Crime Museum charges up to $21.95 for a standard ticket. But Arredondo said he was not thinking of any financial implications of lending the objects and only wants to help visitors learn more about the bombing. Sherman and Wedge said the exhibit cements Boston’s place in the country’s efforts to suppress terrorism and connects patrons to the bombing. Sylvan Lane can be reached at sylvan.lane@globe.com. Follow him on Twitter @SylvanLane. Correction: Due to an editing error, an earlier version of this story mischaracterized an exhibit dedicated to the 2013 Boston Marathon bombing at the Crime Museum in Washington. The permanent exhibit will feature a rotating display of items relating to the bombing.